Today I had the awesome pleasure of going to work with Chris Ames this morning for a few hours. 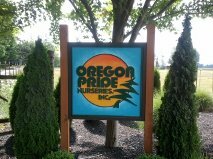 Chris works at Oregon Pride Nurseries. 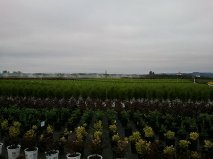 This is the Nursery off of Booth Bend Road and I love driving up to it….so pretty. When I pulled up at 8am this morning Chris was waiting outside for me since the day had already begun much earlier for everyone at the nursery. For me, this was just the beginning of the day with coffee in hand. 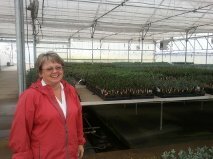 Chris is the General Manager and Production Supervisor…aka, she knows everyone and knows what is going on in every part of the nursery. I couldn’t wait to see what she does! Chris took me on on a tour of her office and showed me her desk. 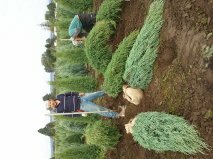 She introduced me to people who are in charge of ordering, fulfilling orders, and a supervisor for the conifers. I am always amazed at how much Chris remembers about each employee. We then headed outside to hop in the truck to find each supervisor to make game plans for the day and days to come. Our first stop? 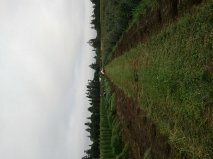 To see rows of trees being cut under the roots and getting ready to pot. 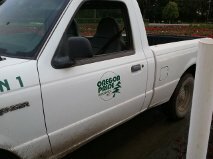 We met up with one supervisor and his crew to catch up with his scheduling and his next steps. Chris asked, “what would you like to do?” and “how can I help make that happen?” I love these questions! They are so empowering and sincere! Chris also gave me the update about where the areas are behind and where they are catching up. They are getting ready for all sorts of things. There are shows and people visiting plus there is product to move. It’s a busy time of year! Oregon Pride sells plants mostly in container but they grow in container and in the ground. I also loved that relationship is key at OPN. I had come to visit many of these folks last year when I was writing a sermon on Cesar Chavez. I got to know, just a little, some of the people I revisited today. Everyone remember who I was and we picked up our conversation here and there. There is obviously a culture of lifting each other up and caring about each person on the team. We were off to the next area to talk about pruning and game plan. 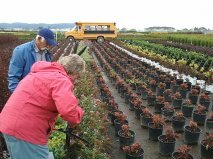 Chris took me over to the shrubs area of the nursery to look at samples of pruning and collaboration with this team. When we got there, this incredible pruner man popped up. He works only on the summers and is amazing at what he does. He walked with us from plant to plant, consulting which would be best for each plant. We moved over to where this supervisor was and we chatted about what she was up to. She was moving plants from the potting area to her area and showed me the importance of getting it all right the first time. If it is not potted correctly, everyone has to deal with what comes in the later seasons. Time to check out what was happening in propagation! I had learned about this technique at Bailey’s and learned here about Chris’ love for this method. This is one of her passions and really an area she loves. She showed me grafting techniques and talked about the struggle of whether or not to share info. There are specialties and it is fun to see how the plants carry on. After some time in the greenhouse, she said, “let’s go find the next supervisor in trees!” So we meandered into trees to find the last supervisor to check in with (I forgot to mention that when I walked in in the beginning the first supervisor came up and we chatted for a bit because we had met a few times before.) I got to see what was happening in potted trees and look at the beauty around me. By the time we got back, it was lunch time at 10am. Chris always eats a peanut butter sandwich and had brought me one too! So we sat outside to chat, eat our sandwiches and drink our coffee (surprise, surprise). There are lessons that I learned from Chris today that I think apply to the church world, some in this final conversation. 1. Encourage your staff to try out new things on small scale. Chris empowers all of her employees to be creative and innovative. 2. The supervisors need to be balanced in gender and get to make the hard decisions. The team really means everything in this culture…what is best for the whole? 3. We always look seasons ahead. In order to be successful you have to think a season ahead. Plants need this kind of planning. 4. Growing plants is a job, growing people is the vocation, the calling. I admire Chris so much for really working with/for her people. She is all about relationship and the human connection. Her ministry is working with her people to create better leaders, better lives, and a community around her. I had a great day! Thanks! Next Post Bring your pastor to work day – Raising Twins!